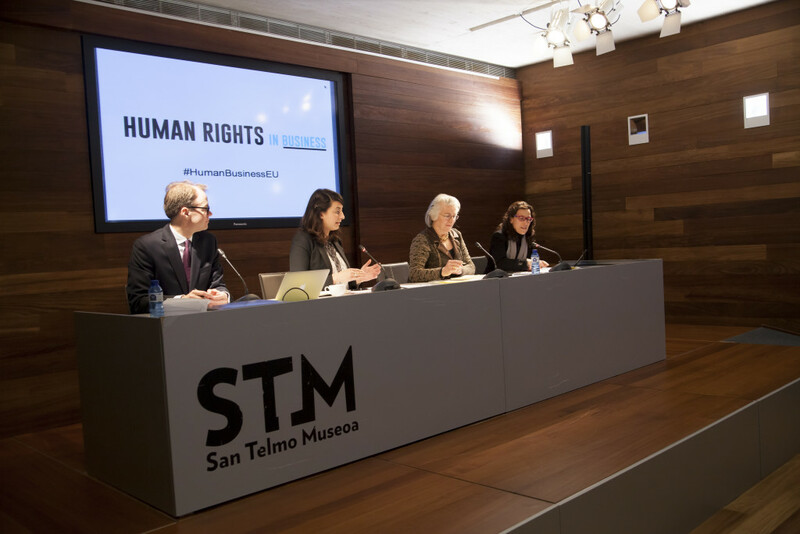 A key objective of the Human Rights in Business project is to train stakeholders (judges, litigators, civil society organizations, policy-makers, business representatives and affected individuals), raise consciousness and bring visibility to access to justice solutions for victims of corporate related human rights abuses. 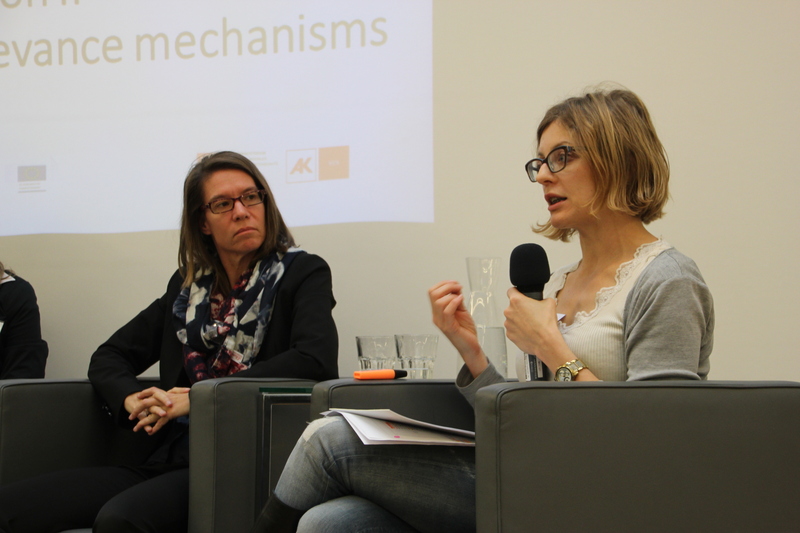 Since project implementation began in September 2014, we have organized a series of training sessions, conferences and seminars. Information, training podcasts and videos, as well as other training materials can be found below. 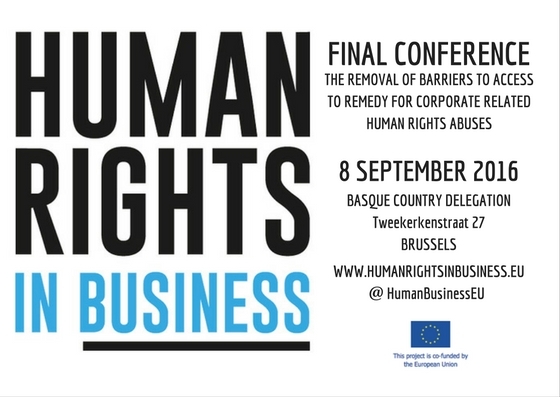 The main objectives of the Final Conference were to disseminate the final research results of the Human Rights in Business research consortium, which focuses on the removal of barriers to access to remedy for victims of corporate related human rights abuses, to develop a relevant debate with experts and business representatives, and to bring visibility to the issues. The event was streamed live from the project homepage with Twitter participation from online participants. 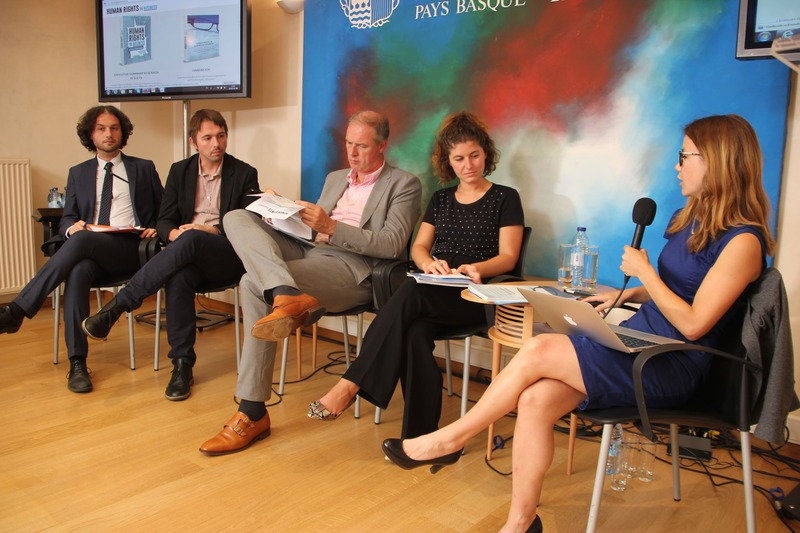 The Executive Summary of the report and the Handbook for civil society organizations and human rights defenders were distributed to participants. 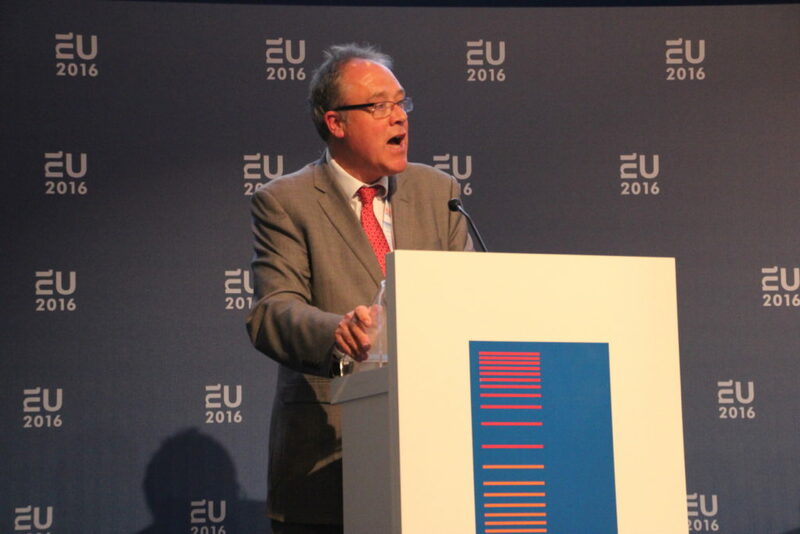 Cees van Dam, Professor Cees Van Dam Consultancy Ltd.
To advance the implementation of the Business and Human Rights agenda of the European Union and its member states, European civil society and the Kingdom of the Netherlands jointly organised a pan-European, multi-stakeholder conference during the Dutch presidency of the EU in spring 2016. 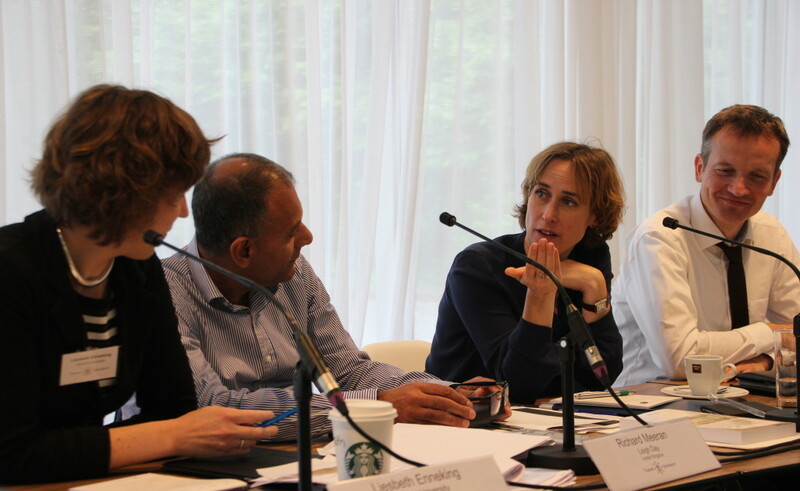 Decision makers, politicians, business leaders, NGOs, trade unions, and researchers came together to discuss how to further advance this agenda together on 11 May 2016 in Amsterdam. The Dutch presidency of the EU in the spring of 2016 coincided with the 5th anniversary of the United Nations Guiding Principles on Business and Human Rights (UNGPs). 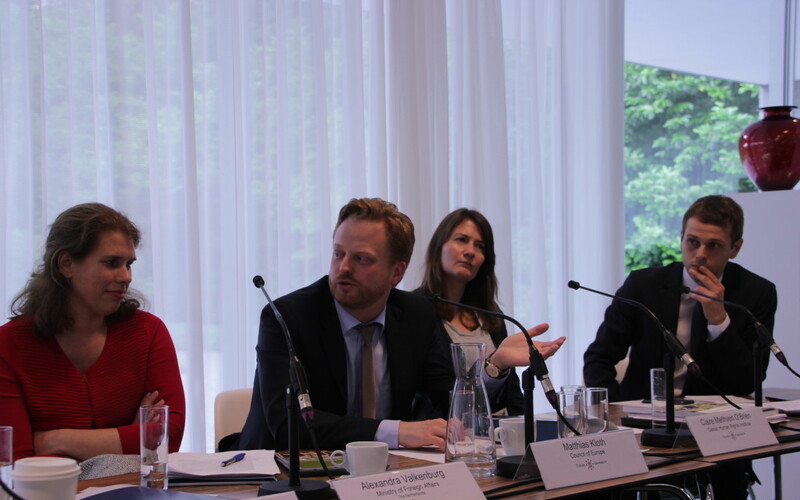 The Netherlands was one of the first states to publish a National Action Plan on Business and Human Rights, and is a strong supporter of the UNGPs. 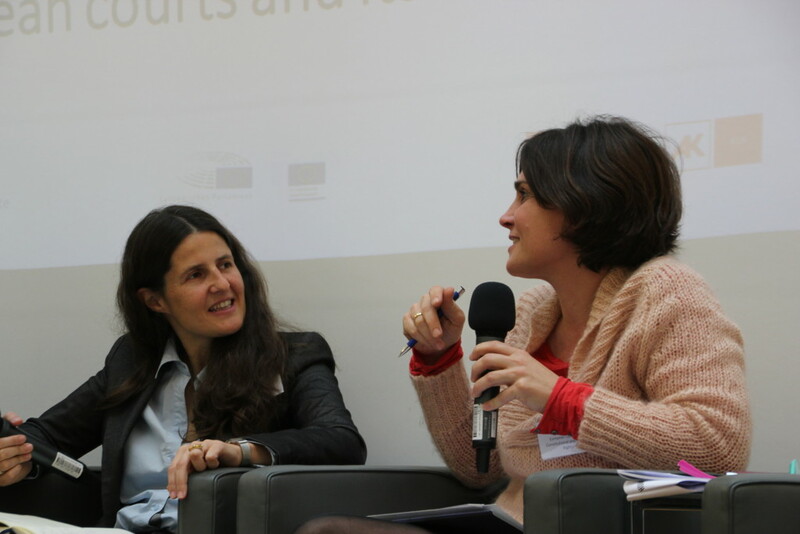 This created an opportunity to reopen the debate on human rights and business in the EU by organising a follow up to the 2012 Conference hosted by the Danish Presidency of the EU. 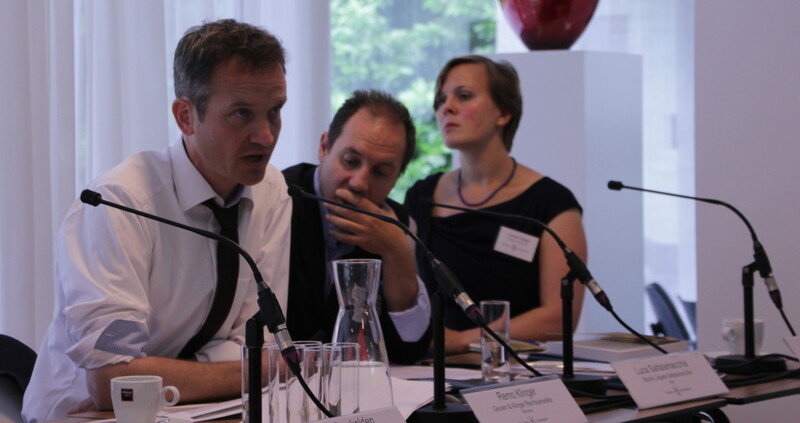 The Human Rights in Business Project and Frank Bold co-organised the conference together with the MVO platform the Netherlands (main organizer), the Kingdom of the Netherlands, the European Coalition for Corporate Justice, the European Network of National Human Rights Institutes (ENNHRI), CNV Internationaal, the Danish Institute for Human Rights, and SOMO. Over 350 people pre-registered for the conference, showing the great interest in the issue. The organizers managed to extend the maximum number of seats for the conference, allowing around 240 people to participate (including the organizers). 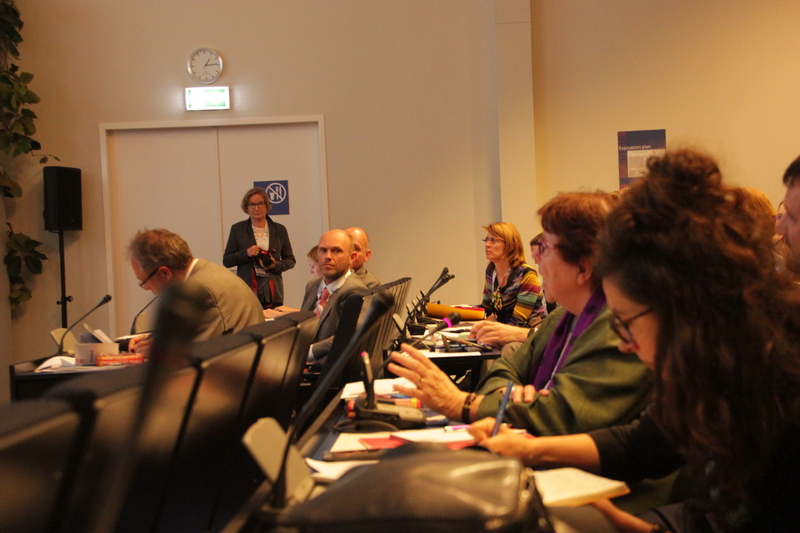 There was interest of all stakeholder groups, and thus all groups were well represented. 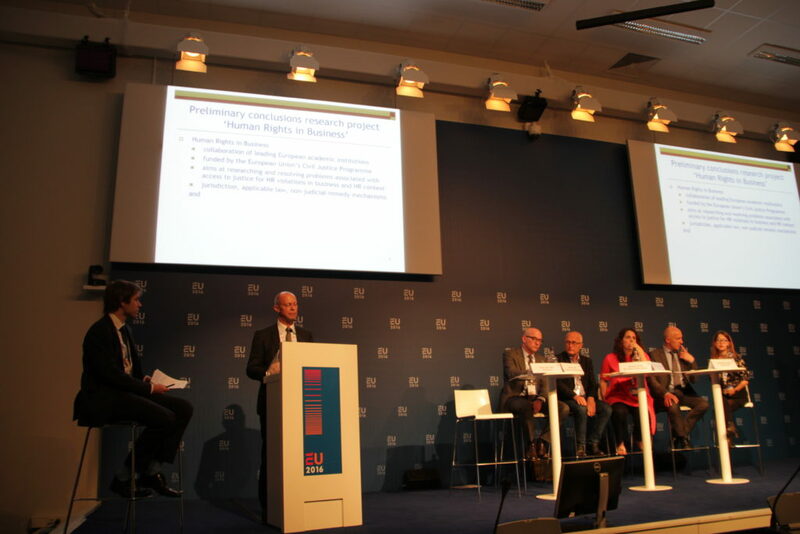 Approximately 20% of the participants were academics and representatives of the National Human Rights Institutions, 25% were business, investor and law firm representatives, 25% were member states and EU representatives and 30% were civil society, including trade unions, representatives. 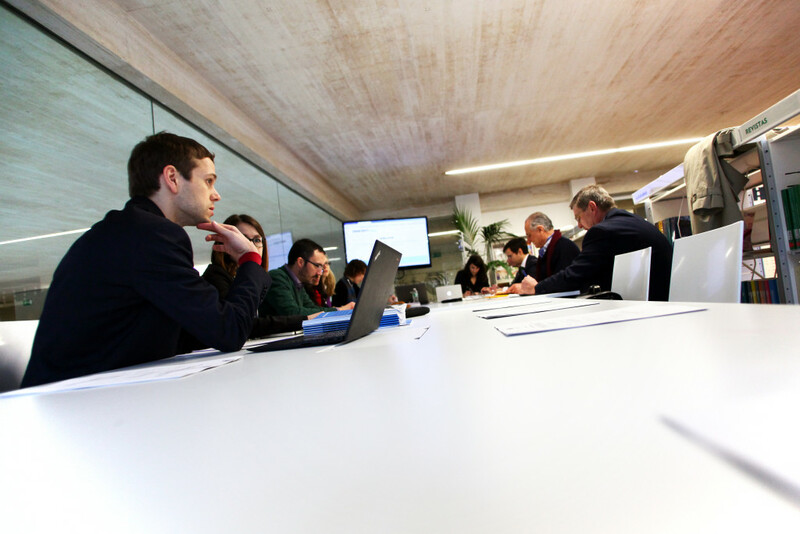 The participants came from 21 different EU member states, Canada, Chile, Colombia, Ecuador, Ghana, Japan, Macedonia, Mexico, Mongolia, Norway, Switzerland and the US. 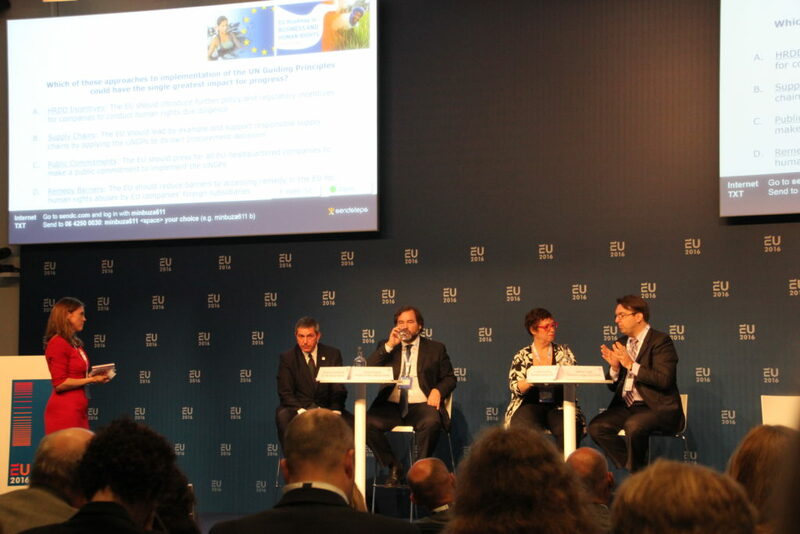 Of public officials and policy-makers, 48 representatives of 17 member states and Switzerland and 12 EU officials participated in the conference. Three plenary sessions were organized: an opening session on the need for an EU Business and Human Rights Roadmap, a plenary session on human rights due diligence and the role of states, and concluding a closing session to harvest recommendations and conclusions of the day. 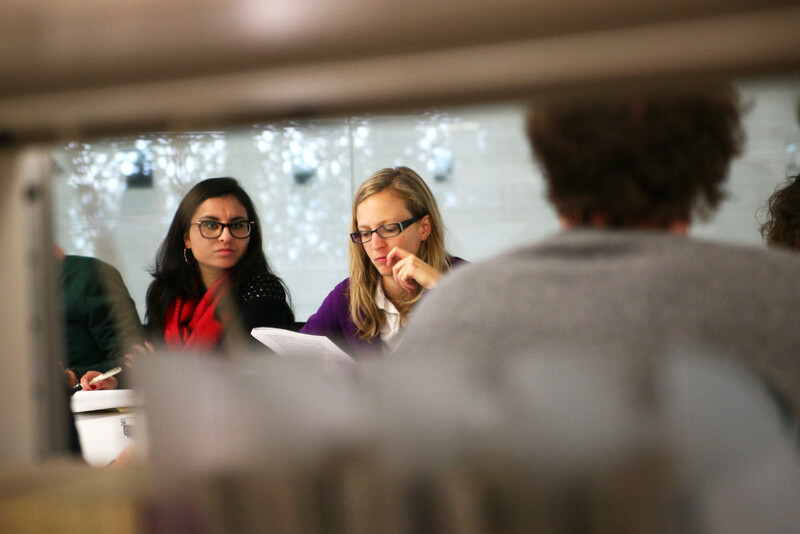 In each of the sessions different stakeholder groups were represented. 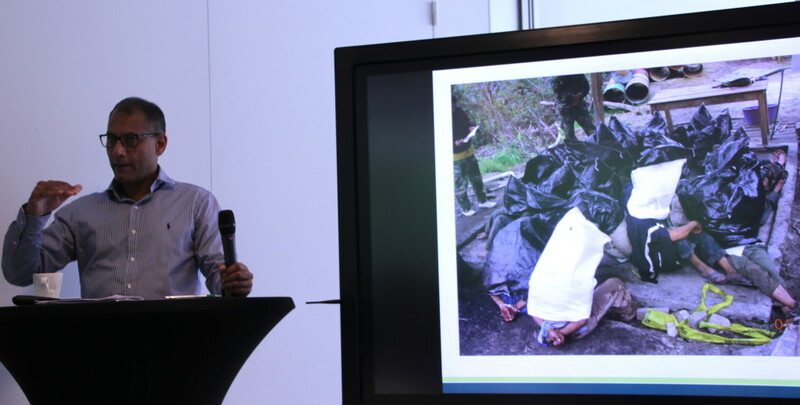 The victims’ perspective was either represented by a member of an affected community or a NGO involved in the negative human rights impact. Channa Samkalden (Lawyer, Prakken d’Oliveira). Sukhgerel Dugersuren (Executive Director, Oyu Tolgoi Watch). 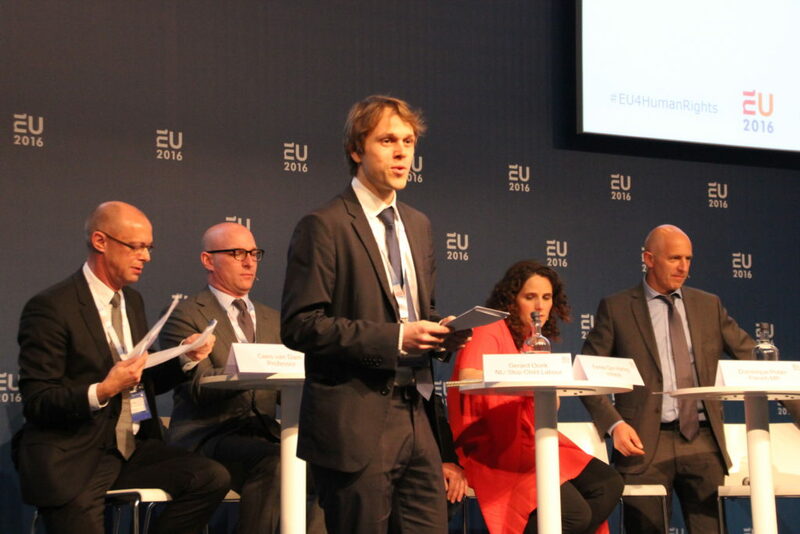 The videos of plenary sessions, the conference report and list of participants, and sessions reports will be available at: http://eu-roadmap.nl/reports-of-the-conference/. 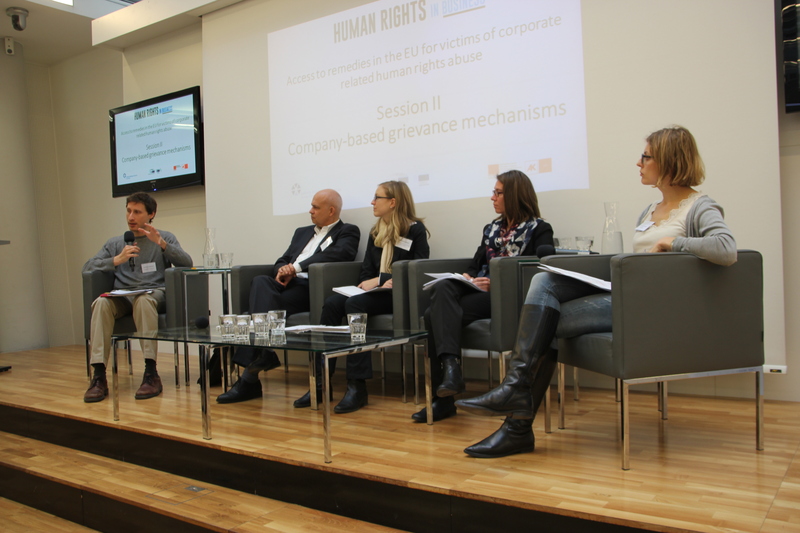 In December 2015, the Human Rights in Business held a training session in Vienna, Austria to inform all interested stakeholders about current legal possibilities and challenges relating to judicial and non-judicial remedies within the EU, through which companies domiciled in a Member State can be held liable for alleged human rights abuses for which they or their subcontractors may be responsible, regardless of where the damage might have occurred. Materials: A glossary of key terms and training session preparatory materials are available below for download so as to prepare the participants for the training session. Jonathan KAUFMAN and Katherine McDONNELL (2016). Community-Driven Operational Grievance Mechanisms. Business and Human Rights Journal, 1, pp 127-132. 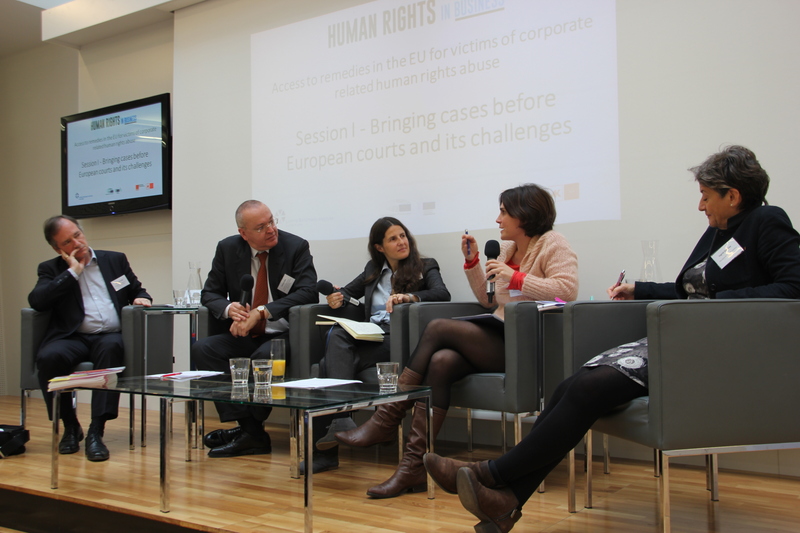 In June 2015, the Human Rights in Business held a training session in Tilburg, Netherlands to discuss the challenges for victims seeking redress in the EU for corporate human rights abuse in third countries. 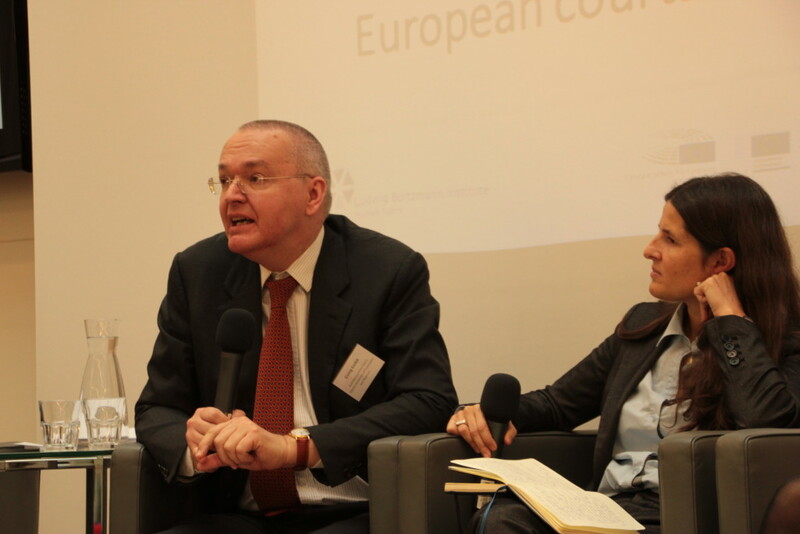 Two panels of speakers including litigators, policymakers and scholars shared their views. 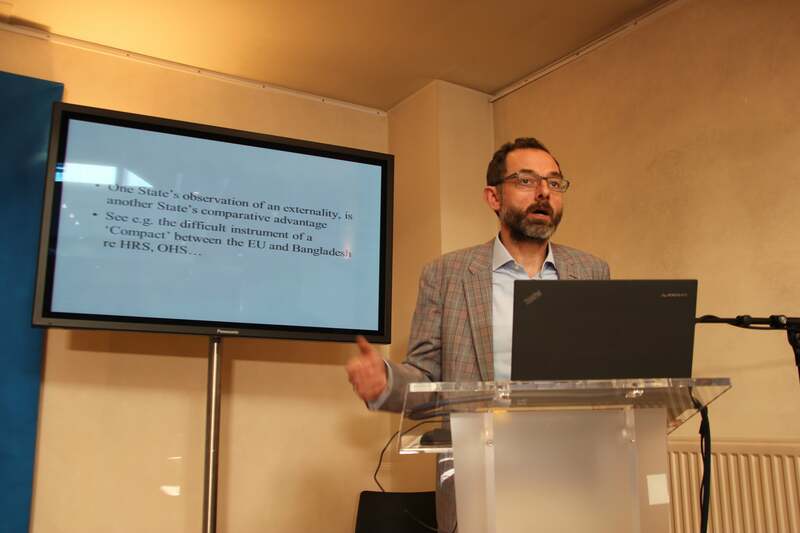 Speakers invited included, inter alia: from the United Kingdom Richard Meeran (Leigh Day & Co), from the Netherlands Channa Samkalden (Prakkendoliviera), from Germany Remo Klinger Geulen & Klinger Rechtsanwälte Geulen and, from Italy Luca Saltalamacchia (Studio Legale Saltalamacchia). 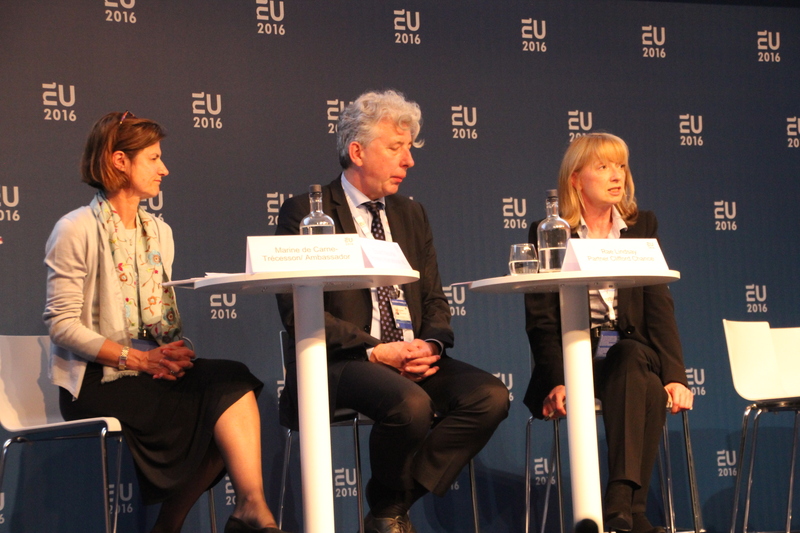 Policymakers from the Netherlands, Spain and the European Commission were also invited to join the discussion. Materials: Preparatory materials are available for download so as to prepare the participants for the training session. For linguistic preparation, a glossary of key terms is available in English. 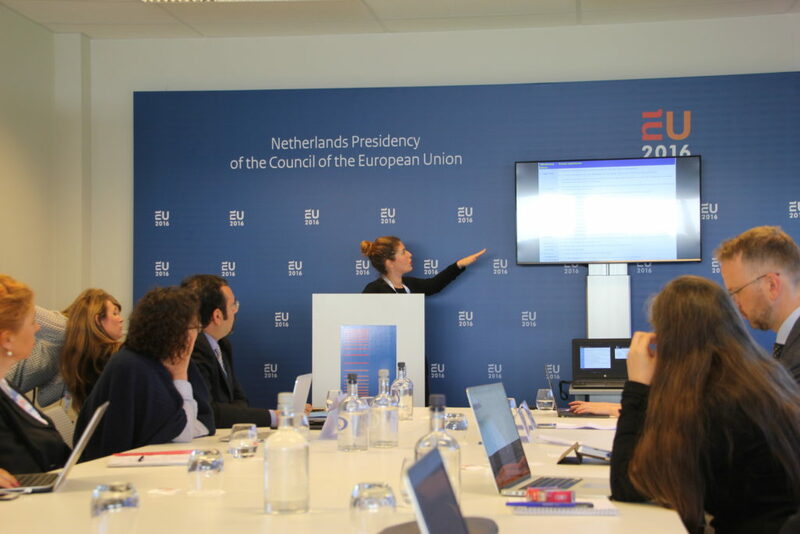 Participants are also asked to review the Netherlands National Action Plan on Business and Human Rights. Speaker presentations: The following materials were used by the speakers in their presentations as part of the Training Session on 23 June 2015 at Tilburg University. 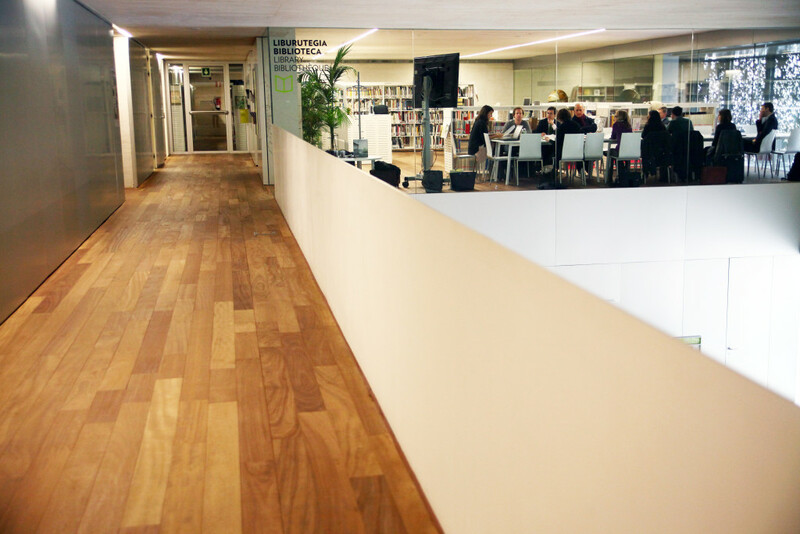 In February 2015, the Human Rights in Business project held a training session in Donostia-San Sebastián, Spain to connect knowledge creators with knowledge users and to facilitate an interchange of knowledge and ideas. 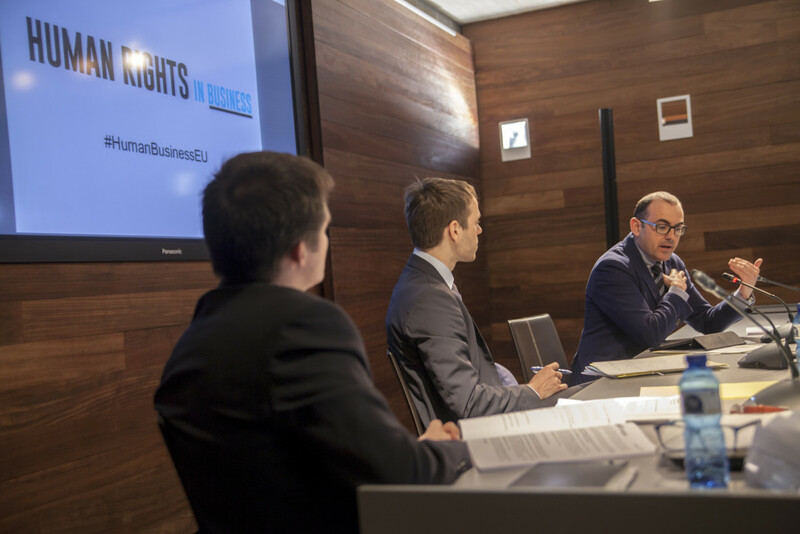 Judges, lawyers, academic experts, NGO representatives and business representatives discussed and analyzed the challenges that occur with the implementation and promotion of effective human rights remedies in relation to international business practices in the European Union. 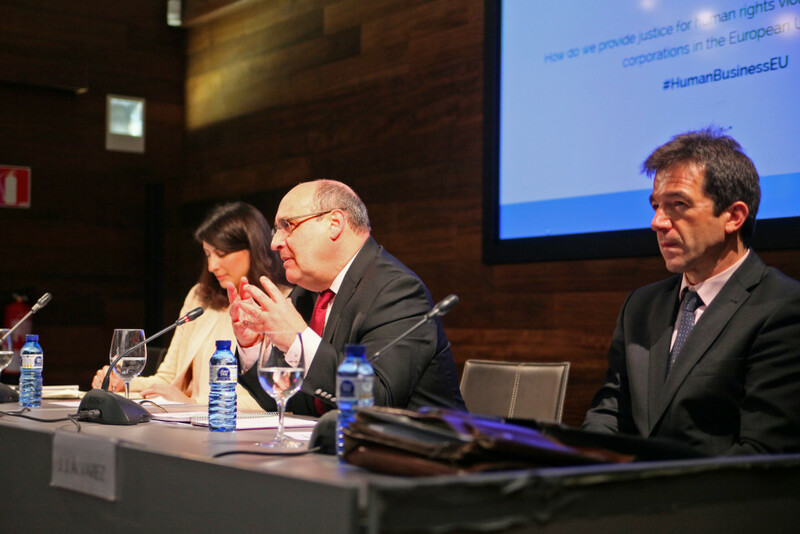 Translation was provided between English, Basque and Spanish. The program and materials are available for download so as to prepare the participants for the training session. For linguistic preparation, a glossary of key terms is available in English and in Spanish. 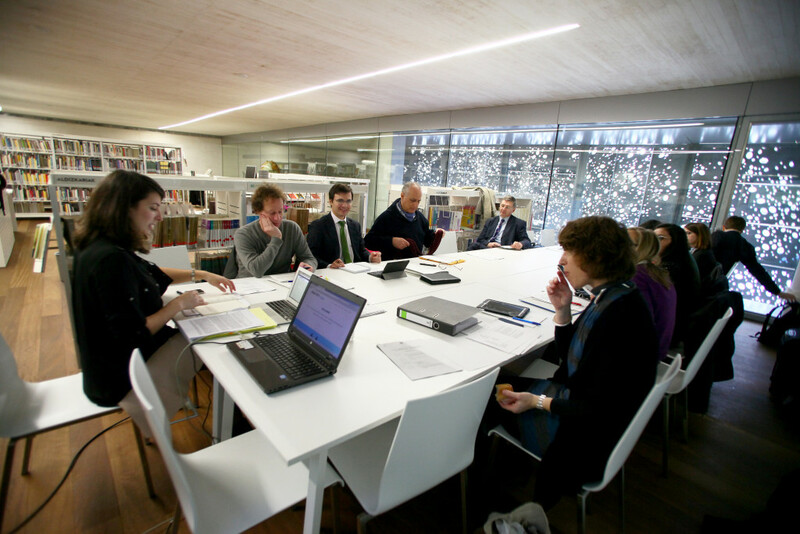 In preparation for the first day of the training session, February 19, a one page case summary of the facts and issues is provided for each of the six case studies that will form the base of the panel discussions. 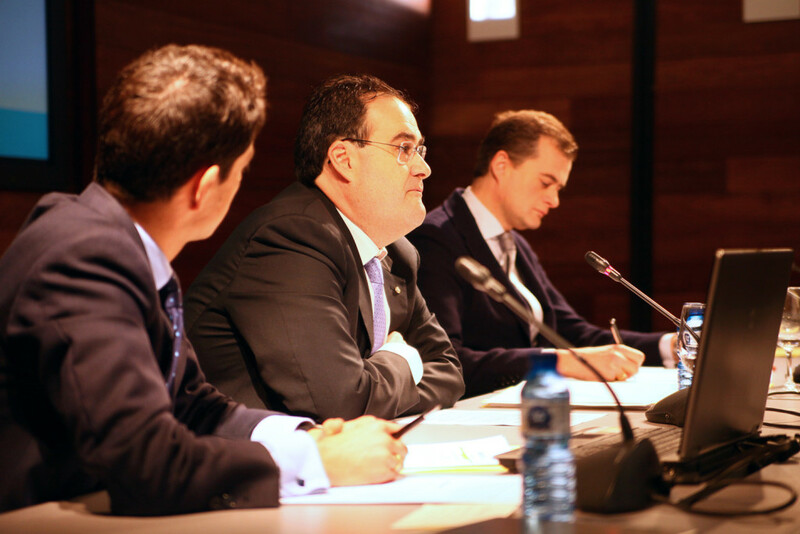 In preparation for the second day of the training session, February 20, participants are asked to review the Draft Spanish National Action Plan (2014) (only available in Spanish). 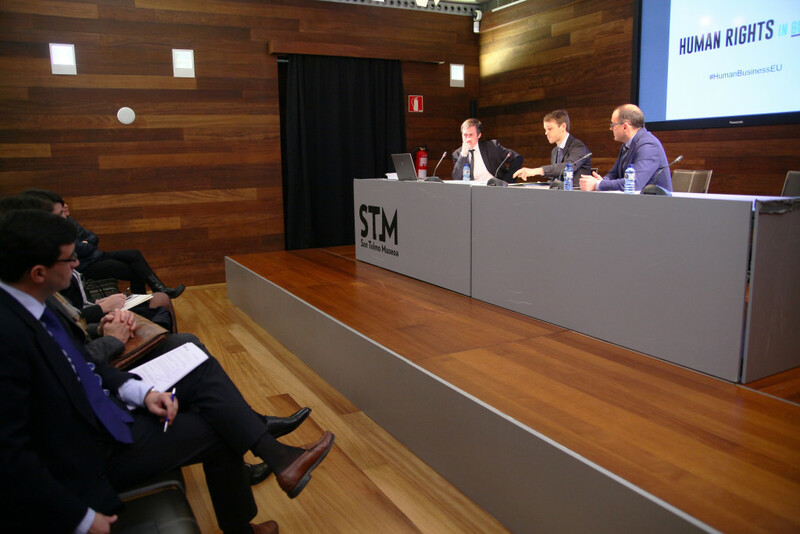 Speaker presentations: The following materials were used by the speakers in their presentations as part of the Training Session on 19-20 February 2015 at the San Telmo Museum in San Sebastian, Spain.